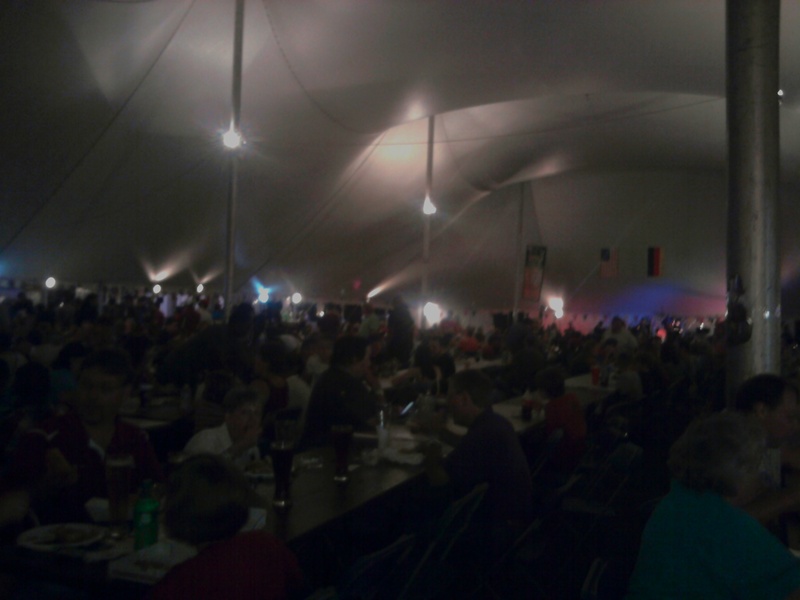 Tonight my dad took my sister and me to a mini-Oktoberfest near his home. It was a lot of fun. Unfortunately, I had forgotten that German food usually consists of beef or pork–the only types of meat I don’t eat. I still got to try some potatoes, and my dad and my sister were kind enough to give me their pickle spears. I was sad that I forgot to take pictures of the food. I guess I didn’t even think about it because I wasn’t the one eating it. I did, however, get a few pictures inside the giant tent. My family ate dinner before people filled the tent. After walking around for a bit and riding a few rides, my sister was ready to participate in some people watching. We figured that since there were a lot of people, at least a few were likely to start dancing soon. Turns out, my sister and I took part in some of the dancing too. We were on our way to buy some pizza (since I hadn’t eaten yet), when a konga line passed by us. I couldn’t resist. And I’m glad I didn’t. It was fun! The tent was packed later in the evening. 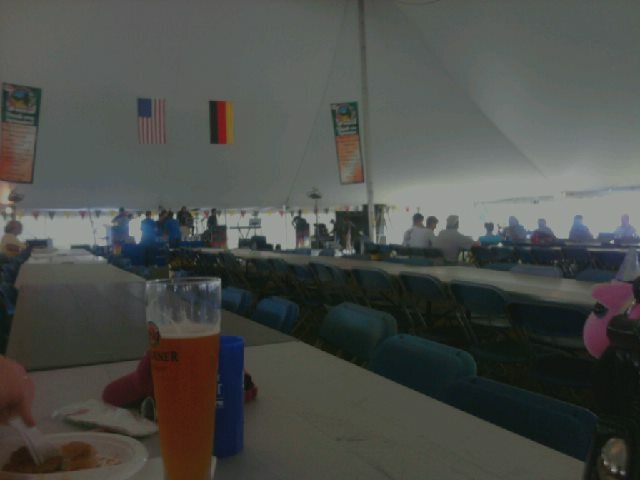 This was my first experience at any sort of Oktoberfest. I’m glad we went. It was like a carnival and an overgrown family gathering smacked into one event. Writer. Wifey. Veg-head. Child of God. 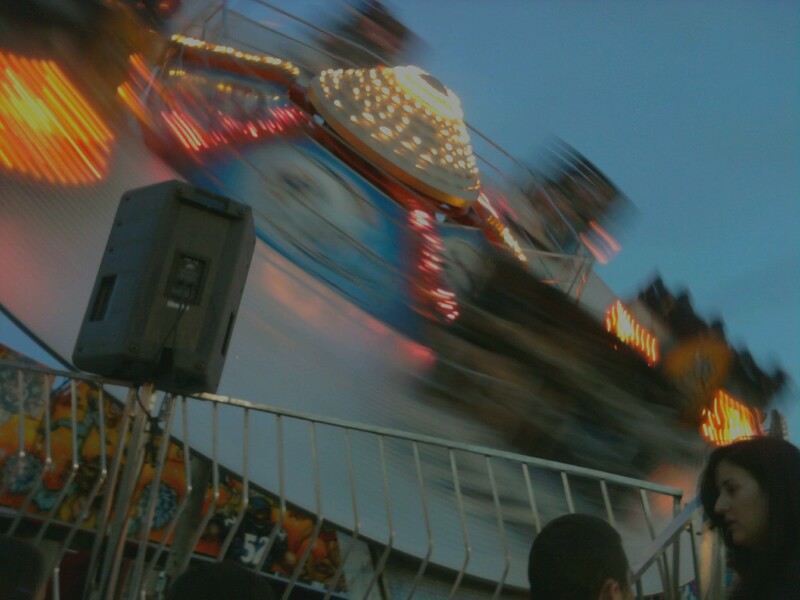 This entry was posted in Uncategorized and tagged beer, bratwurst, brotchen, carnival, food, fun, german, oktoberfest, rides, saurkraut, schnitzel. Bookmark the permalink.